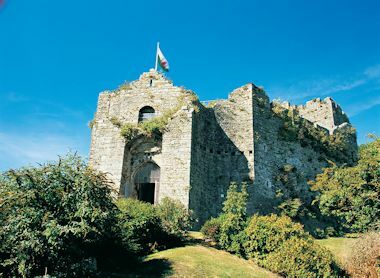 Oystermouth Castle was constructed in 1106 by William de Londres of Ogmore Castle following the Norman advancement across England and the capture of the Gower Peninsula. However, the Welsh retook the lands in 1116 and forced William out of the castle and set it alight. The Castle was rebuilt and changed hands several times over the years but by 1220 it was in the hands of Llywelyn the Great, but by 1220 the tide had turned once more and under Henry the 3rd rule the Welsh were once more expelled and it was placed in the control of John de Braose. The de Braose family rebuilt the castle and it became their principle residence over Swansea castle with Edward 1st paying a visit to them in 1284. By the 14th century the family where living elsewhere and the castle started declined in its importance. As happened with many castle during the middle ages the castle slowly fell into ruin and by 1927 the owners of the castle, the then Duke of Beaufort gave the castle to Swansea Corporation. In 2010 the Castle closed while it underwent major refurbishment before being reopened to the public in 2011.